How to prevent home invasion is really a trick question. Every 20 seconds there is a home invasion. Home invasions have the second highest arrest rate for property crimes in the US at 82.9 per 100,000 inhabitants. Once a potential intruder has it made it up his mind to break into a house there are only a handful of things that can dissuade the trespasser. For the most part they will find a way to break in the house. Even if that means breaking some windows and doors. However, you can make the job appear a lot harder to the intruder. They typically want something that is quick and easy. Unless they have been paid to hit your house they are going to look for the path of least resistance. In this post I will share some tips on how to prevent home invasion. Intruders tend to target homes that they can get away from easily without detection. An ideal home would be located in a dark, lifeless neighborhood with good hiding places and escape routes. If they feel that they can be detected then they will look for another possible target. If your house is far from a road or another house then you need to find some sort of way to light up your yard. There may not be any light poles so you could look into installing a small one for your yard. Motion detection lights can be really helpful. The brighter the better. Also, you don’t want to give the intruder any hiding places. Yes, you may love the landscape of your front yard but you have to consider what is more important. Is it more important to be safe and secure or to have a beautiful lawn? So you may have to cut down some bushes or trees. Most apartment preppers will have an advantage with lighting. For the most part you will have many neighbors in your complex with lights on their front door. If you are in a dark secluded apartment then you may want to consider either installing your own lighting with permission from the landlord or moving. On top of lighting, cameras can be another great tool to prevent a home invasion. You should place multiple cameras around your property even if they are fake. For the most part intruders will not take the chance to find out if the cameras are real or not. For apartment preppers this is going to be a challenge. Many landlords will not allow their tenants to install security cameras outside of their apartment. In that case I would suggest buying a small camera and place it outside of your windows where it can be seen clearly. I just recently installed a camera from D-Link Wireless outside of my window. It is small and doesn’t take up much space but does give me the ability to see during daytime and nighttime. Additionally they have an app that you can install so that you can view the surveillance from your phone or even laptop at any time. There are notification settings that you can enable that go off when the camera picks up activity. I would recommend this to every apartment prepper or suburban preppers on a budget. 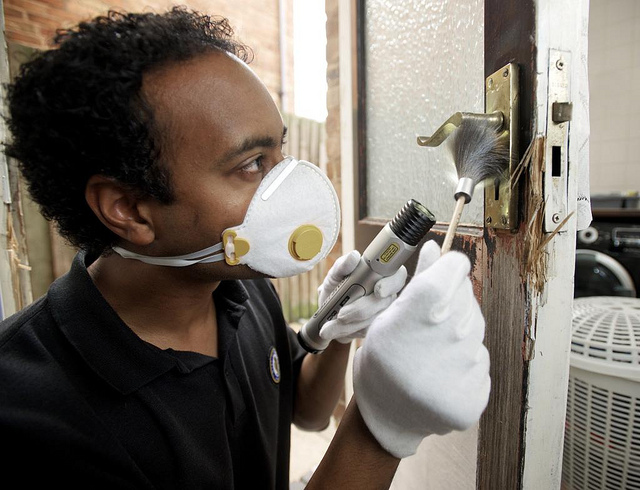 33% of intruders approach through the front door of their target home (PR Web). 87.5% of home invasions were done by forced entry. So for the most part intruders are not going to take the time to try and pick your lock (Airef.org). So you need to fortify or strengthen your doors and windows. You can fortify your doors by installing metal frames or posts. Wood is pretty easy to break. All you really need is either a sledgehammer or even an axe. If you have windows on your door then you are extremely vulnerable. You could also install some heavier doors. Unfortunately apartment preppers will not really have the ability to change their door posts and doors. An alternative to that is purchasing a Dual Function Security Bar under the door knob. This won’t totally prevent someone from kicking in your door in but it will slow them down and provide you with time to either get your weapon or escape. You can check out the review for the one that I have installed in my apartment HERE. Standard windows could be replaced with hurricane strength windows. It is quite expensive to purchase. The other option is to install security window film. This will again SLOW DOWN the intruder from breaking into your home giving you time to escape or grab a weapon. The final option would be to install some hurricane shutters. Again this option is expensive. You would also have to use a remote in order to activate the shutters. It wouldn’t be something that you would have up throughout the day. Nonetheless, if you combine the shutters with the previous suggestions you house will become a fortress. 60% of burglars indicated that the presence of an alarm would cause them to seek an alternative target (Airef). If the intruders are able to get pass your fortified door, hurricane strength windows and shutters then they will be met with an alarm. This alarm will either scare them off or make the intruder more anxious to complete the job as quickly as possible. However, smart intruders will consider cutting the alarm system beforehand if they have scoped out your location. 25% of intruders cut alarm connections (Airef). Therefore you might want to consider installing a wireless alarm system. Yes, they could be super bold and cut off your electricity altogether but for the most part they are not going to go through all of that work. Giving intruders an obstacle to climb over will work as another deterrent. For those that take to risk to climb your fence or wall you can also place sharp objects at the top such as barbed wire or glass chips. This will make it difficult to climb over while also inflicting some pain. Along with a security system having a dog is another great deterrent. Many intruders don’t want to be met with a biting defender. Dogs are normally very protective over their territory especially against strangers. If the intruder knows that you have one they will typically look for another target. Some people have even purchased a system that gives off fake barking sounds to make it sound like they have a dog. In conclusion, you want to give potential intruders multiple reasons not to break into your house. Once they have identified your house as a target it is almost impossible to stop it. You can slow down the invasion but not stop. Therefore your best bet is to use these tips on how to prevent a home invasion so that they look for another possible target.